It came down to the final play, but the Vikings held off the Packers to pick up their first NFC North division title since 2009. Each of the offensive units struggled to get anything going, but the Minnesota defense had the final say as the Vikings won 20-13 in Green Bay. It came down to the final play, but the Vikings held off the Packers to pick up their first NFC North division title since 2009. Each of the offensive units struggled to get anything going, but the Minnesota defense had the final say as the Vikings won 20-13 in Green Bay. They managed to overcome a lopsided time of possession towards Green Bay and limited Eddie Lacy to just 34 yards rushing. The Vikings traded field goals with the Packers to begin the game, but entered halftime with a 6-3 lead after a 32-yard field goal by Blair Walsh. Their first field goal was aided by a 41-yard fake punt run by Adam Thielen. The key momentum shift in this game came at the start of the second half. The Vikings defense forced a three-and-out and went on a 6-play, 58-yard touchdown drive, capped by an Adrian Peterson 3-yard touchdown run. They added a ten point cushion and forced the Packers into more passing situations. This allowed their defense to bring more pressure and resulted in a strip sack by Everson Griffen and a 55-yard fumble recovery touchdown by Captain Munnerlyn. The Packers added a 16-yard touchdown from Aaron Rodgers to Richard Rodgers to bring it within 10 points. Green Bay accumulated one more field goal after a three-and-out to bring it within one score. The Packers had two chances to tie the game, but an interception and a heave into the end zone as time expired catapulted the Vikings to a gritty 20-13 win for their first NFC North division title since 2009. Teddy Bridgewater's performance wasn't great and he made several big mistakes, but the Vikings defense did enough to win. He finished the day just 10-for-19 with 99 yards and an interception. His lone interception was a poor decision as he threw the pass with his left hand into traffic. Not to mention, he missed a wide-open Jerick McKinnon up the sideline for what would have been a touchdown. Bridgewater wasn't up to form and will need to play much better if the Vikings want to compete next week against Seattle. The offense was just 2-for-11 on third down and couldn't sustain drives. Their lone offensive spark came to start the second half as they went on a six play, 58-yard yard touchdown drive that was capped by a 3-yard Adrian Peterson score. A 26-yard handoff to Adam Thielen out of the backfield moved the ball deep into Packers territory and several tough Adrian Peterson runs fueled the drive. The offense didn't have the ball much in the second half though. The Packers ran 47 offensive plays, while the Vikings had just 19. It's incredible that the defense maintained energy at the end of this game. The offense has to get into a better rhythm next week or the Seahawks offense will tear up the Vikings defense. For the most part the protection was better, but Matt Kalil had a poor game. Clay Matthews and Julius Peppers both reached Bridgewater and were hardly blocked by Kalil. The Packers had just three sacks, but the pocket certainly wasn't great when it needed to be. Adrian Peterson rushed for 67 yards on 19 carries and added a touchdown to begin the second half. He was running hard and carrying defenders to pick up plenty of tough yardage. Peterson did leave the game for a quarter with a sore back, but x-rays came back negative. He returned to the game in the fourth quarter and recovered a critical fumble that Teddy Bridgewater didn't place well. Peterson said his back is sore after the game, but that he would be just fine for next week. The Vikings were carried by his ability to run the ball well when nothing else was clicking. What's more, Adam Thielen stepped up for a big 26-yard rush out of the backfield. McKinnon added 15 yards on four carries and the Vikings had a team effort on the ground in Green Bay. Everson Griffen had two sacks and a huge strip of Aaron Rodgers that led to a 55-yard return touchdown by cornerback Captain Munnerlyn. He was rushing hard off the edge at the end of the game and his sack of Rodgers late in the contest put a major strain on the Packers offense. After the game, Mike McCarthy was praising Griffen calling him the best defender the Vikings have. He had his eyes on the prize and added added six total tackles, including three for loss. The Vikings defensive line battled the entire night despite Green Bay controlling time of possession 35:42 to 24:18. They already had limited bodies, but still managed to sack Rodgers five times on the night. It was a complete defensive effort up front and the Vikings controlled the line of scrimmage. What's more, they managed to hold Eddie Lacy to 34 yards on 13 carries and James Starks to eight carries for 24 yards. That definitely was the difference in this one. Aaron Rodgers went 28-for-44 for 291 yards, a touchdown, and an interception. He didn't play his best game and is having a tough time as his receivers struggle to gain separation up the field. The Vikings played a true team style of defense and it paid off as they held the Packers to just 13 points on offense. Eric Kendricks had nine tackles and Anthony Barr added five as they continually cleaned up some of the poor tackling up front. They shut the door on several screen passes and were diagnosing plays so quickly. Kendricks was playing fast and ferocious as he moved sideline-to-sideline. He tackled the running backs low and delivered several big hits that stunted the Packers' offensive flow. Both of these players have been big difference makers as they've prevented big plays from occurring in the second level of the defense. Barr has such good instincts and can be a threat in coverage and in the pass rush. If these guys can continue to play at a high level, the Vikings defense can be a threat for opposing offense's in the playoffs. The defense is playing really well, but the Vikings stay in the playoffs will be dependent upon if their offense can find an identity down the stretch. Cordarrelle Patterson had an open crease on a kickoff return and was deep in Packers territory as he was stripped by kicker Mason Crosby. The Packers recovered and it gave them the ball with a chance to tie the game as they were down just one score. However, Aaron Rodgers pass was intercepted by Xavier Rhodes and the Vikings re-gained possession with 2:09 left. They would go three-and-out, but on the Packers next drive, their last second heave to the end zone was incomplete as time expired and the Vikings won their first division title since 2009. Patterson didn't seem too phased by his mistake and if it would have proven costly, he would have been a talking piece by many at the conclusion of the game. The Vikings started to pile up some injuries as they battled until the final seconds against Green Bay. Adrian Peterson left with a back injury, but returned after receiving x-rays. Adam Thielen injured his shoulder, but the severity is currently unknown. The most serious injury came to tight end Rhett Ellison who suffered a torn patellar tendon. He is huge in the Vikings' gameplan and does plenty of dirty work for this offense. He'll be a big loss to absorb. Anthony Barr left for a play, but came back and Kenrick Ellis injured his lower leg and never returned. The Vikings need to get healthy as they will need their full arsenal for Seattle next week. However, Linval Joseph should be healthy as the Vikings prepare to attack the Seahawks. The Vikings won the NFC North and will be the #3 seed for the playoffs. They'll open the playoffs at home against the Seattle Seahawks. Kickoff is at 12:05pm CT and the game will be televised on NBC. The Vikings had a team goal to make the playoffs and win the division. They managed to clinch a playoff berth last week, but won the NFC North for the first time since 2009 with this win over the Packers. The Packers were swept at home by division opponents for the first time since 1968, the year Lombardi retired. Minnesota picked up their first winning record on the road since 1998 and will host their first outdoor home playoff game since the 1976/77 NFC Championship Game against the Los Angeles Rams at Metropolitan Stadium. The Vikings ending up winning that game 24-13 and advanced to the Super Bowl against the Oakland Raiders. This team will have their hands full as they square off with a Seattle team that his steaming hot as they enter the playoffs. 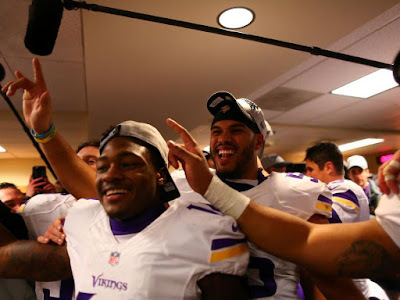 However, who doesn't believe the Vikings couldn't defy the odds again? They won a division road game, beat a team with a winning record, won a prime time game, won a division title, and beat the Green Bay Packers. Keep calling this team an underdog, but they've sure found ways to win this season. A home playoff game is well deserved for the players, coaches, and fans who have waited for this opportunity for a long time. Soak it in Vikings fans, this team is on the rise.